ETP OMS helps customers to formulate the pre-packs (size sets) for the new styles and place purchase orders at pre-pack level for initial allocation to the stores and place bulk orders at SKU level for replenishment. Inventory at pre-pack level can be maintained and delivered to stores. Pre-pack can be broken down into stages to get the stock at individual SKU level. Pre-pack function will help retailers to streamline inbound and outbound activities, drastically reduce the processing time at the warehouse and enable faster allocations of inventory to stores. 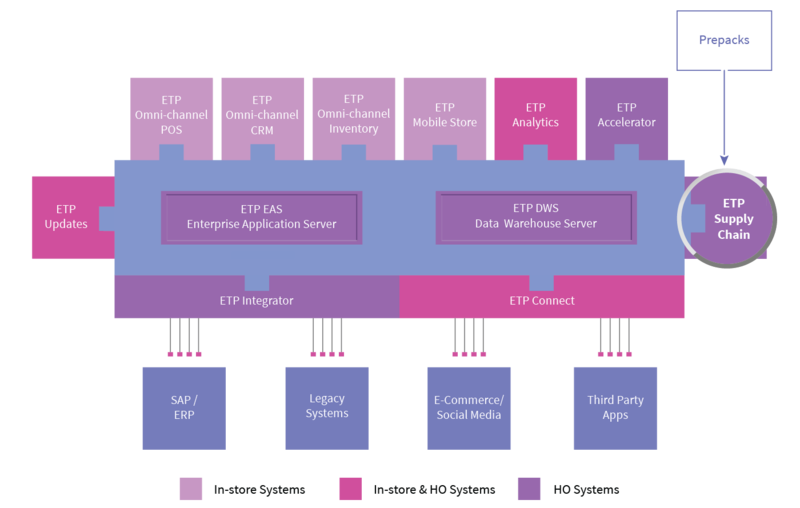 ETP V5 Omni-channel Retail Solutions comprising omni-channel POS software, Mobility (mobile POS), CRM software, Marketing and Promotion Campaigns, Order Management & Supply Chain Management, Omni-channel Analytics and Omni-channel Connect provide you with features such as Click and Collect, Click and Deliver, Endless Aisle, a holistic view of the inventory, and a single view of the customer enabling you to deliver a unified brand-customer relationship across all channels. This is done using real-time integration of ETP’s POS solution, CRM solution and Promotions engine with webstores and marketplaces using ETP Connect’s secured web services framework, which has the ability to see and manage order flows.